Today’s styled shoot took place at the Swan Coach House, an immensely charming historic venue in Atlanta. Our talented creatives captured the essence of a romantic wedding in a color palette of marsala, blush and touches of gold, with lush florals adorning the ceremony backdrop and elegant reception table, as well as the beautiful bouquets. Every timeless detail is utterly inspiring, from the blush bridesmaids dresses to the whimsical floral wedding cake and cascading table centrepiece; and the day ended perfectly with an iconic sparkler send off! A few words from the team about the inspiration behind their vision…. “Our inspiration for this shoot was to shine a modern light on an already historic, elegant venue. The Swan Coach House is a historic gem located in the heart of Atlanta. It’s charm and indefinable character is unrivalled by any other venue in the city. With new bold, romantic details and a chic backdrop, we were able to create a timeless setting. This styled shoot captured all the aspects of a real wedding day, starting with the beautiful styling of our bride and bridesmaids by Margaret Snider Artistry! The ceremony backdrop Host & Toast provided truly blew us away! Though it is beautiful on its own, the additional floral display by Stylish Stems made it an absolute showstopper! Stylish Stems also created a lush cascading floral display that perfectly complemented the vintage chic table and chairs provided by Peachtree Tents and Events and Collection Event Furnishings, and helped bring our vision to life. 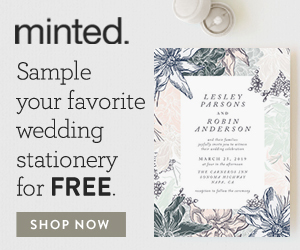 Castle Paper Company was our go-to paper goods vendor for this shoot! Her whimsical and elegant style is exactly what we needed in order to perfectly complement the stunning gown from Fabulous Frocks! I Do Linens enhanced the modern vintage feel of the shoot by adding a richly textural velvet green linen to the cake that tied the entire look together. Finally, Confection Perfection created an exquisite three-tier cake to top it all off! Isn’t the palette just perfection?? Oh marsala how I have missed you! A huge thankyou to everyone involved behind the scenes of this dreamy editorial, but especially to Natalie of 4Corners Photography who captured every detail so perfectly. If you love her photography and would like to see more of her work you should take a peek at their website at www.4cornersphotography.com – and don’t forget to follow Natalie& Tyler on Instagram. Now if this has you dreaming of a floral-filled, garden wedding of your own, you might want to take a look at this this romantic garden wedding inspiration at Houston Oaks, or this chic garden wedding styled shoot in a similar palette. captured at Cornerstone Sanoma (the color palette is heavenly), and this fabulous farm to table wedding inspiration. Or if you’re looking for the perfect historic venue for your wedding, then you should take a look at this vibrant wedding inspiration shoot at Felicity Church, this elegant Winter affair at Hampshire House, or this olde world wedding inspiration at The Hollywood Castle. And this modern vintage beauty at Swan House is not to be missed!